If you are wondering where to take your kids to have fun in Barcelona region, then a day trip to Tarragona woul be such an amazing idea. This city is rich in history, culture and full of fun and entertainment, making it an ideal destination for a unique family holiday. Tarragona is the second largest city of Catalonia. 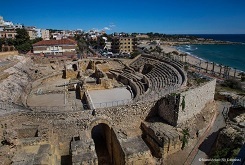 So, while you are staying at our hotel by the beach in Vilanova, why not plan a day trip to Tarragona? It is only 45 min by car or 40 min by train.